The centerpiece of the Equestrian Park is the 85,000 square foot, state-of-the-art Event Center. This Event Center is among the largest in the Intermountain West, featuring a 45,000 square foot floor arena surface. The footing in the indoor arena is exceptional. 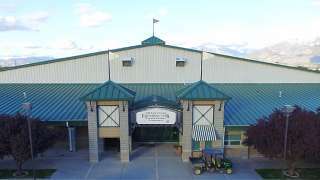 Whether you rein, barrel race, cut, rope or show, our staff can expertly prepare the arena for your event.The Event Center can seat up to 3,000 spectators in retractable bleachers. The Event Center offers a portable-flooring system for events such as concerts, tradeshows and the Salt Lake County Fair. It also features a concession stand, plenty of restrooms and a large mezzanine suitable for receptions, vendors and tradeshows. The building is climate controlled year-round. The Laurel Brown Racetrack is the state’s finest track and host of world-class Quarter Horse racing. The races feature many of the industry's top horses, trainers and jockeys. The ¾-mile track features grandstand seating for 2,000 people and a breakaway rail, and a schedule that always delivers action. Racing fans can also enjoy the uniquely Western sport of chariot racing when the snow flies and the temperature drops. The Park features five outdoor arenas ranging from simple warm-up arenas to a lighted, 5,000-seat rodeo arena. Our newest feature is a 39,000 square foot covered arena measuring 130 feet by 275 feet. This beautiful, 12-acre grassy field is open every day during Open Ride, except when an event is scheduled. The Park occasionally hosts polo matches on the grounds and it is often booked for other special events, such as equestrian shows and the Salt Lake County Fair. The field is also available to sports teams for tournament play. Check with your Event Manager for pricing and availability. The triangle field has multiple uses, such as vendor displays, flea markets and receptions. Parking is located next to the field, making access easy for patrons. This facility is available to rent for meetings, parties or receptions. It features a fully-equipped kitchen and one restroom. Additional restrooms are accessible from the outside of the building. The park has 306 stalls for show boarding, with easy access to the arenas. There is also ample room for temporary stalls on the property. The Equestrian Park has paved and unpaved parking lots around the facility. Overnight camping in an RV or trailer is allowed in conjunction with an event, with approval from the Event Manager. Fees apply. Space is not available for recreational house trailers, cars, trucks, boats and other vehicles. Unauthorized vehicles will be towed at owner’s expense. The Equestrian Park assumes no liability. If you are participating in an event at the Park, horse trailer parking is free of charge during event days. Trailers must be parked in the location provided by the Event Manager for the event. The Equestrian Park reserves the right to move trailers at any time for any reason. Trailers inappropriately parked or unauthorized trailers will be towed at the owner’s expense.